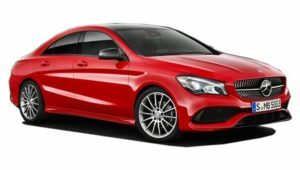 Mercedes CLA is the entry level compact premium sedan based on the Mercedes A Class platform. It was introduced internationally in the year 2013 and came to India in 2015. The CLA carries forward the all new design language adopted by Mercedes internationally and is credited for carving out an attractive entry price for the Mercedes brand in India. The 2017 CLA is a refresh on the existing model with some minor modifications on both interiors as well as exteriors of the car. The neatly designed headlamps that are fully LEDs now along with a smart LED treatment to the tail lamp enhance the visual appeal of the car. Elegant use of chrome under the air dam & on rear bumper underskirts may not be very noticeable at the first glance but it sure adds a dash of charm to the already good looking car. On the inside one is welcomed by a larger 8” screen in lieu of the earlier 7” which is also compatible with Android Auto & Apple Car Play. One of the main selling points of the CLA-Class is the way it looks. Unlike any other Mercedes vehicle at this price point, the CLA manages to look exotic thanks to its coupe-like profile and frameless doors. The front-end sports the diamond finish grille (in select trims), massively sculpted air intakes and a chin spoiler that gives it an aggressive look. The clean sculpted lines on the sides add to the styling of the vehicle. At the back, the impressive design is completed by the neatly carved bumper with a sharp looking boot lid. The MFA (Mercedes Front-wheel drive Architecture) platform that underpins all front-wheel drive products from Mercedes’ portfolio is also seen on this vehicle. Even though the CLA shares the same underpinnings as the A-, B- and the GLA-Class, it has a greater ground clearance, a change the manufacturer has brought in for Indian road conditions. The same, however, cannot be said about the interiors of the Mercedes-Benz CLA. Now don’t get us wrong, like any Mercedes of recent vintage, the quality, the fit and finish and the choice of materials, is all up to the mark. But then, there’s just no originality here. It’s all A-Class. So, you have similar instrumentation, similar tablet like display stuck on the dashboard and of course similar overall design for the dash as well. The aviation inspired aircon vents are a carry over as well. The steering wheel, the centre console look and feel, and the use of silver accent on the dash, however, are all unique to the CLA. As Far as space goes, the Mercedes CLA isn’t a very spacious car and it’s best used as a four seater. But, we won’t term it as cramped. The curved back for the front sports seats liberate decent knee room for rear passengers and with just two seated at the back there’s more than enough elbow room as well. But yes, the rear head room, given the CLA’s coupe like roof line, is tight. The average Indian shouldn’t have a problem but six footers are in for some discomfort. Seats in the meantime give you very little to complain about. These are well contoured, well padded and high on comfort. And the ones at the rear, though not adjustable in any way, are still angled thoughtfully with comfort in mind. The 2017 Mercedes CLA gets the same 2.0-litre petrol and 2.1-litre diesel engines. The variant we tested had the petrol engine. The powerplant unleashes 183 PS of power along with 300 Nm of torque. Mated to the engine is the same 7G-TRONIC gearbox that we’ve been seeing since quite a while on various Mercs. The petrol CLA has a top speed of 235 km/hr while 0-100 km/hr comes up at a notch below 8 seconds. The diesel engine is the familiar unit we’ve seen on some other Mercedes cars and we’ve always liked the oil-burner. The petrol engine is super refined. Driveability in the city is stress-free and low-end performance is pretty good. Things get even better post 1500 RPM when the power surge starts to increase. Power delivery feels smooth all the way up to 6000 RPM without the CLA losing its beat. The mid-range is punchy and there is some steam left even at higher RPMs. At high speeds, the gearbox does a great job but it feels a bit confused at city speeds. Also, it has a tendency to upshift very early and the solution to this is to switch from Eco/Comfort to Sport. Sport mode lets you explore the full potential of the car and the exhaust sounds sweet near the redline. The noisy diesel engine is not much of a trouble once it catches sufficient pace. The in-cabin noise insulation is very impressive as it does not let any redundant noise seep in. The other bit where the CLA impresses is in handling. The ride and dynamics are impressive especially on hard uneven roads. Driving the CLA45AMG, with its low ground clearance, is absolutely horrifying as it often scrapes the under belly on almost all speed breakers but the standard CLA-Class has its way on them with a taller ride position. The suspension setup is not exactly for stiff style driving but it is sufficiently agile to take on corners at great ease. If you are driving the CLA petrol around the corners, the vehicle just denies leaving the tarmac even when pushed hard. Credit for this goes to the McPherson strut front axle and four-link rear axle which ensures great control while manoeuvring. The 2017 Mercedes-Benz CLA-Class includes stability and traction control, antilock brakes, a driver knee airbag, front-seat side thorax airbags, front-seat side pelvic airbags, full-length side curtain airbags and a rearview camera. A forward collision warning system with automatic braking and a drowsy driver warning system are also standard; they are optional or not available on most other luxury cars. Also included is the Mercedes-Benz Mbrace2 emergency communications system that includes automatic collision notification, an emergency call button, remote door unlocking and stolen vehicle recovery. The optional Driver Assistance package adds a blind-spot monitoring system (available separately) and lane departure warning and intervention. It also raises the speed threshold for the forward collision warning system. The CLA is available in three trims and two engine options. The CDI Style diesel is priced R31.5 lakh; the 200 Sport petrol is priced R35 lakh; and the 200 CDI Sport diesel is priced R35.9 lakh (ex-showroom, Delhi). The car currently has only one competitor in India, the Audi A3, which is priced from R24.5 lakh to R30.2 lakh. While the CLA is priced higher, yet it comes across as a compelling package. It behaves well on Indian roads, is frugal and has a design that won’t go out of style any time soon. Unlike the A3—and, ironically, many other Mercedes cars—the CLA won’t get lost in the crowd. It is not exactly a car for chauffeur-driven buyers, but if you are a young, moneyed professional who enjoys driving and loves turning heads, the CLA makes sense.